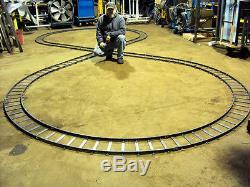 This is a 24 X 11 foot figure 8 track set made entirely out of hot rolled steel, the rails are 3/8" X 1" inch stock and are connected together with 1/8 X 1 inch stock. 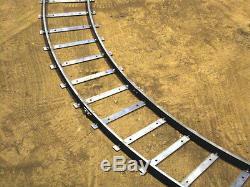 Track set consist of 12 curved tracks with a radius of 5 feet, the smallest we make, 4 straight tracks and one cross track, all connecting hardware is supplied, all you need to do is paint them and add the wooden ties, screw holes are punched in each cross bar to make the ties easy to install. 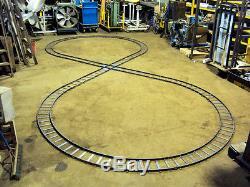 The item "Figure 8 Track Set 7 -1/2 Gauge" is in sale since Sunday, April 5, 2015. 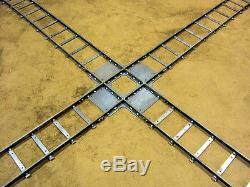 This item is in the category "Toys & Hobbies\Model Railroads & Trains\Rare Scales\Other Rare Scale". 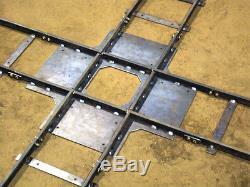 The seller is "dchris2" and is located in Cleveland, Ohio. This item can be shipped to United States.